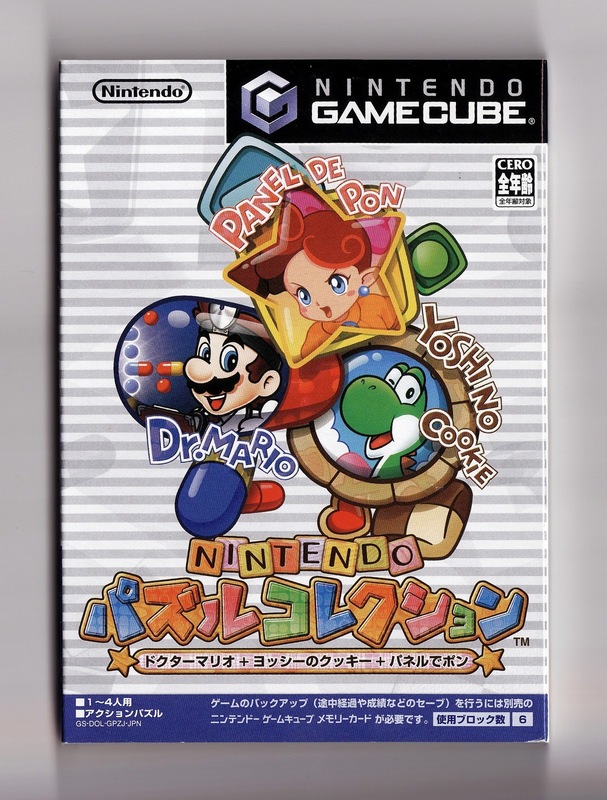 The main draw of this colorful compilation, which sadly never saw the light of day outside of Japan: The previously unreleased Nintendo 64 port of Intelligent Systems' Panel de Pon (reworked, renamed and released as Tetris Attack in the States). 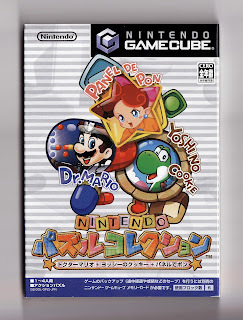 Like all three of the ports included on this minuscule GameCube disc, this iteration of Panel de Pon features greatly improved--compared to the source material--graphics and sound. 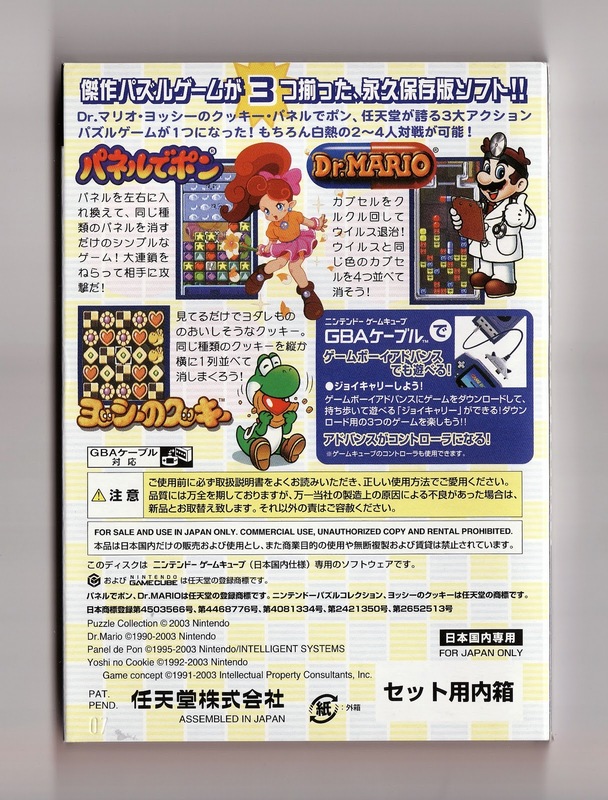 It also features a four-player mode--again, just like its Nintendo Puzzle Collection compadres, which includes an enhanced port of Dr. Mario 64 and an updated version of Yoshi's Cookie. (One final noteworthy feature of this release: Panel de Pon's 3D mode which, while interesting, isn't as fun as the traditional 2D mode.) 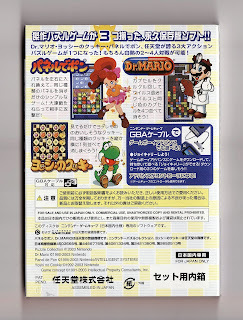 Oh, and if you have a GameBoy Advance handy, you can use the bundled cable to download simplified versions of each puzzler to your portable system of choice and play them until it's powered off. This one is kind of a thrill! I had no idea this game even existed. It's a damn shame it never came to the states, because they'd have at least sold one copy...to me. I don't think I knew it existed until someone on NeoGAF put it up for sale sometime last year. It's a nice little game, really -- esp. if you can find it on the cheap. BTW, while doing a bit of research for this post I discovered that it originally was planned for release in the US, but those plans were scraped for some reason. Drat! A few years back you could buy this on Play-Asia for like, some ridiculous amount of money like USD$10.00. That's what I did. I thought it was an okay game I guess. Yeah, I would guess that's still pretty cheap today, Suika. The only problem, of course, is that you either have to own a Japanese GC or Wii -- or a homebrew enabled Wii from another region -- to play it, so it's probably not worth much to most people outside of Japan. Also, I have to admit that I rarely play it. I pop it in to play Panel de Pon now and then, but that's about it. Of course, I'm not a big fan of Yoshi's Cookie and I have the WiiWare version of Dr. Mario, so that's about the only reason I would play this game.